If Alexa is going to become more than a digital pet rock it is going to have to convince users that the hassle of learning how is worth their while. Amazon.boasts that Alexa, its artificial-intelligence assistant, can perform more than 50,000 skills.The problem is, most people still use it to turn on the lights, play music or time the pasta. 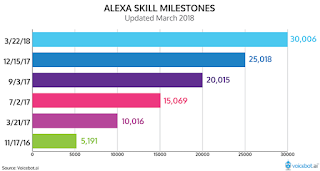 It is accelerating efforts to make Alexa more useful, from enhancing its conversational chops to offering outside developers financial incentives to make better Alexa-compatible voice applications, allowing them to charge users for purchases within skills, such as premium content from a media service, or hints or special powers in a game. The goal is to incentivize developers to make Alexa a more valuable platform. Amazon.boasts that Alexa, its artificial-intelligence assistant, can perform more than 50,000 skills. The problem is, most people still use it mainly to turn on the lights, play music or time the pasta. The online retail giant, battling competitors including Alphabet Inc.’s Google for voice-assistant supremacy, is accelerating efforts to make Alexa more useful, from enhancing its conversational chops to offering outside developers financial incentives to make better Alexa-compatible voice applications, which Amazon calls skills. Amazon last month expanded the capability of Alexa developers to allow them to charge users for purchases within skills, such as premium content from a media service, or hints or special powers in a game. The goal is to incentivize developers to make better skills and ultimately make Alexa a more valuable platform, Amazon says, much as Apple Inc. did with the App Store. Amazon has sold an estimated 47 million-plus devices in the Echo family since its launch in late 2014, giving it a roughly 51% share of the smart-speaker market, according to Loup Ventures. Device prices currently range from $40 for a hockey puck-size Dot to $230 for its latest screened version. Last month, Amazon unveiled 15 new and updated devices in the family, including an amplifier and an Alexa-enabled microwave oven. hasn’t taken time to figure it out, she said, is she can already just look at a clock or switch on a light. “It just seemed like a gimmick to me,” she added. Part of Amazon’s response has been to enhance Alexa’s ability to carry on human-like conversations. Now it responds to a string of commands all on the same topic or offers a hunch, such as that someone might want to turn the lights off when they go to bed. Rohit Prasad, Alexa’s head scientist, said Amazon has made thousands of skills searchable. When a consumer asks how to get a stain out of a shirt, Alexa will narrow down skills to offer, evaluate which has the best answer and use that one to respond—in this case, with a tool from Good Housekeeping that offers stain-removal tips and instructions. “I think we’re getting to a point where customers are saying, ’I’m sure Alexa can do a lot more things than I’m aware of,’ ” said Tom Taylor, senior vice president of Amazon Alexa. The subscriptions and other purchases within skills that Amazon is now allowing typically cost from 99 cents to $1.99, with discounts for Prime members. They follow Amazon’s move last year to reward developers with payments based on downloads and usage. The incentives are aimed at getting companies and people like Gal Shenar, a Boston-based software developer, to develop stronger Alexa skills that improve the quality of its app store. Mr. Shenar created a game for Alexa users called “Escape the Room.” Users get an imagined situation, like a car fully submerged in water, and use verbal commands to explore their surroundings, find tools and try to escape. He has added hints that are available for purchase—and users, who number in the hundreds of thousands, have steadily started to purchase them. Still, Mr. Shenar said, while “a lot of the potential profits are unlocked” in Apple’s App Store, “that’s not yet really possible with Alexa.” Monetizing aspects of creating things for Alexa is “going to make a big difference in how companies approach building skills for the platform,” he predicts.Michele Audish, age 20, until recently used her family’s Echo only for music or turning on the lights, but she recently asked Alexa about a giant box she saw at the nearby Los Angeles Grove shopping complex. It turned out to be a “Jurassic World” advertisement. Afterward, Alexa pitched her on playing a Jurassic-themed choose-your-own-adventure game. She paid the $1.99 and played for about an hour, answering yes-and-no questions to try to help save the dinosaurs.